The excitement of starting and managing your own business is often too hard to contain. You end up sitting at your desk spending more time thinking about your new mobile business idea than time the you spend on your current job. It's tough to balance the two, but it's important to realize that starting a new business takes an average of $30,000. That obviously could be much higher or lower depending on the type of company you plan on opening, but the point is, you're going to want to keep costs low if you're on a tight budget. Luckily, working with a tool like iBuildApp means that you don't have to get stuck with incredibly high costs. Making an app in the past could have costed you upwards to $10,000. There's no reason for that now. In fact, a mobile app has the ability to cut some of your costs with customer service tools, automation and conversion boosting settings. So, keep reading to learn more about the keys to launching a mobile business on a tight budget. As we discussed above, a pre-built template is by far the easiest, and least expensive, way to go about building your mobile app. When utilizing iBuildApp you already have an incredible number of templates to choose from, and it doesn't matter what niche your company is in. Schools, barbers and regular businesses are all covered, so the whole point of a template is to get launched within just a few minutes. All you have to do is punch in your business information and get going from there. For some reason lots of mobile businesses get started by paying other people to write content for them. Yes, most paid writers are going to develop better content than you, but you're just getting started, so why not save some cash and write your own? You're the one who knows the most about your business in the first place, and you can always give the content to someone you know to proofread and spellcheck. Cover all of the pages on your mobile app, and ensure that you touch on all the essentials like contact information, people working for you, hours and services. 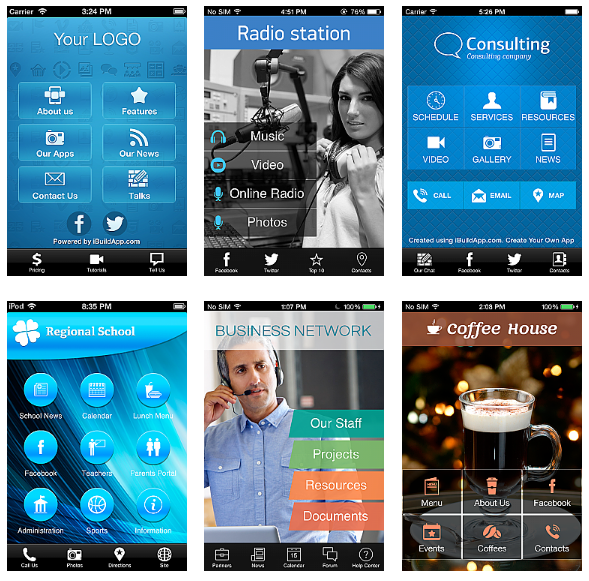 The whole point of a mobile app is to expedite some of the many processes you have to go through every day. Consider implementing a quick call or quick email button on your mobile app homepage, or install a reservations or booking page if you run a restaurant or mechanic business. From social media sharing to emailing people on your list, the internet is filled with options for free marketing. The best part is that iBuildApp has a comprehensive page for completing all of these tasks. For example, developing a banner on your website or sending out a mobile app download landing page to customers is all included with iBuildApp. Let's face it, there's no reason to rent an office or sign up for a shared space if you're just getting started with your business. Do yourself a favor and save that cash by working from home. Managing a mobile app is generally going to cost you a little bit of money, but most of the plans you can select from are affordable as long as you choose the right one. For example, a premium plan from iBuildApp is best for companies with under 1,000 downloads, while the more active users would consider an unlimited plan. From customer service chats to social media walls, mobile apps have various features for getting people to contact you and even talk to each other without setting up a completely different module for customer support. This is yet another way to cut down on the amount of money you spend on day-to-day tasks. Okay, we mentioned that it's a good idea to write your own content to save some money early. However, it's not a great plan to assume that you can do everything on your own. If you don't know how to design logos, hire an affordable freelancer for that. If you're troubled about developing your own app, consider a freelancer or look into the custom development service offered through iBuildApp. There's no secret recipe to launching a mobile business on a tight budget, but if you follow some of the steps above you should be well on your way to saving money with your successful business. If you have any other suggestions on keeping costs low, give us a comment in the area below.